A map from the source rig to the standard rig. It is defined in the MakeWalk: Source Armature panel. A map from the target rig to the standard rig. It is defined in the MakeWalk: Target Armature panel. 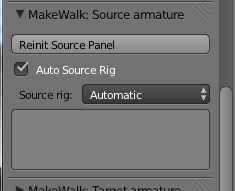 Auto Source Rig: If this option is enabled, MakeWalk will try to identify the source rig automatically. It may happen that MakeWalk fails to identify the source rig automatically, but this is very unusual. If it should nevertheless happen, it is possible to define the bone map manually in analogy with how it is done for target rigs. Source rig. A list of bvh rigs recognized by the mocap tool. 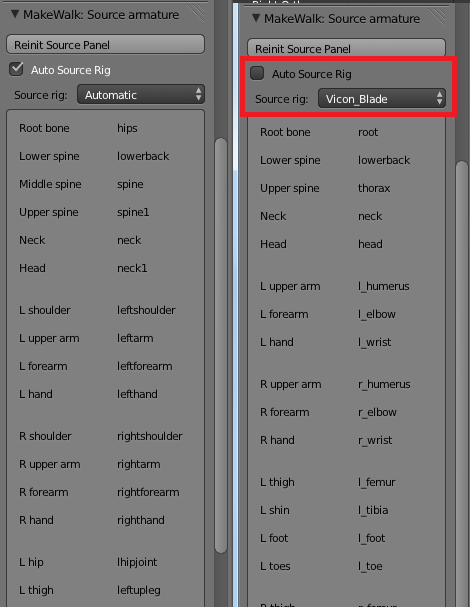 This either defines the expected source rig (if Auto Source Rig is disabled) or to Automatic. Bones in the active source rig.